I am a type A personality. I like having a place for (just about) everything. I witnessed a friend with seven kids do her laundry. She piled all of her clean laundry into one big pile and then the kids and her got to work tossing and sorting it all into individual baskets. Honestly, the first time I saw it I was shocked. What?!?! You don’t FOLD your kid’s laundry? During those days I spent most of nap time catching up on the chores and folding my one child’s plethora of little pajamas. Then our family expanded to five kids. Suddenly, my friend’s system was the only thing that kept me continuing to do the laundry during that crazy first year. 1) It is a Time Saver: If I had to wash, sort and FOLD seven plus loads of laundry per week, then I think I might loath my kids wearing clothes all together. No one would be allowed outside for fear of grass stained shorts and muddy shirts and the hours that it would take me to do all of that laundry. 2) Kid’s Clothes Don’t Really Stay Folded Very Well Anyway: I’ve tried folding my son’s 2T jeans before and it just isn’t meant to happen. My middle son’s 5T shirts don’t stay folded very well either. Not to mention that by the time the clothes got carried up two flights of stairs it would probably look like no one had even tried anyway. 3) They Would Be Wrecked The Very Next Day: In order for my kids to get dressed independently in the morning that means that they are going to rummage through their own drawers to find something to wear. In one fell swoop (even if I did fold their laundry) I am certain that their drawers would still look like this by the very next day. 4) Each child has different personalities and that is actually what I love about each of my children: I do have a few children that like to fold their clothes at times. I encourage them to do so if they want to. However, I also realize that having a messy shirt drawer is totally ok for my kids who aren’t going to necessarily be as organized as their mother. I’m trying to teach them that their drawers don’t have to be all put together and that there are things that matter more…like having happy hearts. 5) I actually find JOY in doing the laundry and don’t dread the necessary task: I enjoy keeping up on cleaning the clothes. However, I am convinced that if I were forced to fold every piece of clothing in our house I might never do anything else or enjoy anything else for that matter. Do you feel liberated? Do you feel ready to go? Do you feel like NEVER folding your kid’s laundry ever again? Want to stay connected? Check out these great ways! Good for you! I'm happy for you and your laundry-foldling liberation! I am curious though, what do you use in your washer/dryer? Do you have a secret? Because heaped in our laundry basket my kids' clothes become horribly, horribly wrinkled. Maybe I should try, a different detergent or fabric softener? Long ago I gave up folding jammies, underwear or socks. In fact, I don't even sort them out between the 5 kids. All clean jammies get tossed in a laundry basket kept in our laundry room and the kids just come and grab what they need when they are getting ready for bed at night. Same goes with kids' underwear and socks- tossed in a laundry basket all together and kept in our upstairs hallway closet. Kids just grab their own clean items as needed. But, not folding their tops and bottoms… you might be onto something there. 😉 Thanks for sharing! I don't have any secrets for a detergent or fabric softener that I love. I actually just recently switched to making my own only because of the economical benefit. I do shake out their clothes (as I'm sorting each piece) and turn everything right side out. So by the time it goes in their basket and then their drawer at least it isn't a jumbled ball. I think that tends to help. I love all these ideas. One thing I do is to keep a spray bottle filled with water handy and just lightly spritz anything that's wrinkly. It's pretty amazing. Great idea. I have to try this with my three children. I hate folding and usually stall until I have 5 full loads waiting to be folded. I'm ready to try this! So glad to hear I'm not the only one. My husband gets on me all the time because I do all these loads of laundry and then am just too exhausted/overwhelmed to start the folding. I just sit and stare at the baskets for days… I'm going to try this, even though I feel like I'm a bit OCD about folding since I also worked in retail for a while. 🙂 Thanks for the article. That sounds wonderful. I would love not to have to sort, fold, put away, etc, all of our laundry. BUT, what about wrinkles? I hate wrinkled clothes. How do I avoid that? I think it definitely comes down to personal choice over if you feel taking the time to fold is worth more than a few wrinkles. I only tried doing it this way out of desperation and what I have gained (in saved time) has totally made it worth it to me but I know that not everyone would feel the same way. I do shake out the kid's clothes (as I'm sorting each piece) and turn everything right side out. So by the time it goes into their basket and then their drawer at least it isn't a jumbled ball. I think that tends to help fight the wrinkles. I just want to add my two bits – I buy all white socks for each child and then I dont have to match them. I try to make each one recognizable. they just grab two and put them on. when they start running out of socks due to holes I throw them out and buy a new set ( two large pkgs). I never have a lost sock bin. just to clarify I have 5 kids four of which are boys but the same goes for my girl. I have to add about socks….the greatest "trend" right now, is mismatched socks! They are sold that way (with like colors) and since I started buying those I don't have any problems with the kids not having socks. I read your post last week, and I thought how amazing you are. I have always been totally OCD when it comes to folding clothes, and have fought with my oldest daughter on a daily basis, literally, about how she just destroys my hours of work. Last night, I decided to give it a try. Hope I gain some sanity. I think I'm not 100% committed, since I at least folded everything in half before throwing in the basket ;), but it's a start. Great post! We play the sock matching game! My kids love to be the one with the most matches!! this is seriously revolutionary (i am totally type a also – it drives me crazy to not have a place for things or for things to not be put away!)! do you leave the kids clothes in baskets, or do you just use the baskets to transport the clothes to the dressers? i gave up on putting everyday clothes in brody's dresser in his room (too far from where i need them:)), so i have a plastic three drawer cart for each munchkin downstairs. brody has just recently discovered the joys of pulling out the drawers and dumping everything out, so this might change my world – i might have to do the same with some of MY everyday clothes too;)! My husband is worse at leave clothes all messed up and unfolded when he rummages for clothes in the morning than my kids, it drives me crazy. Thinking I might start using this system with him, at least! My son couldn't care less if his clothes are neat or not as he just grabs the first thing he sees to wear. My daughter is a bit more picky about clothes, but she tends to pull them out to try on and leave a pile on the floor in front of the wardrobe anyway. I've been playing with the idea of giving the kids more responsibility with their laundry, so this might be part of the answer. That just leaves myself and my 2yo to fold laundry for. this is also a sanity saver in our house. I also don't iron unless they want to wear it straight away but they have to bring it to me and ask. the oldest is nearly old enough to iron on her own but neither really care for the straight pin look. and nothing gets washed unless it makes it into the washing basket next to the washing machine. my 5 year old understand that rule so its easy. both girls know they are in charge of their clothes and I wont interfere with how they sort and store them unless they are strewn across the floor, in which case they loose those clothes for a while. only takes once or twice for that to hit home. That is great that you have things in place so that your kids understand what is and not ok to in your family when it comes to clothes! Hang everything up and don't buy anything that requires ironing. This system has been working for me since 1990. I don't even own an ironing board. I hang everything also, except for pjs, socks and underwear and pants. I'm trying this lady's method for those things as half the time its just a jumbled mess anyway. I think you just listed a bunch of reasons why I don't fold my own clothes. Granted I do hang most everything up and iron when needed. I do love this approach for your kids though. 🙂 Stopping by from Thrifty Thursday. I love this. I only have one toddler at the moment, but I definitely think this will be the way we go as she gets older and more are added. I think it's grea you've recognized how your children are different from you and may not care if the shirts are all thrown in the drawer. I think you've made a great choice in having them help with the laundry so you can have more to spend with them! I love this list & I'm pinning it for future reference. I'm stopping by from Inspire Me Please (#6 Pumpkin Crock Pot Oatmeal and 12 First Day of School Picture Tutorial) Have a great weekend! My son started doing his own laundry at age 9. He often had wrinkled clothes but he didnt care and he learned as he went. I use sock clips sometimes to keep pairs together when you first put into the laundry basket and the clips can go all the way through the laundry cycle. I've never heard of sock clips before…those sound great! The sock clips sound like an idea, though I'm not sure my kids would use them, taking into account their personalities. Throwing it into the dresser has not worked; I end up with a plethora of unmatched socks. I might have to break down and just purchase all white socks. 🙁 Sad because I'm an artist and love colors! I do all the laundry but I fold mine, my husbands, and communal items like towels. For the kids I place their clean clothes on their beds and they fold them and put them away. It has always just been looked at as one of their responsibilities and an extension of needing to take care of your personal belongings. That sounds like a great way to involve your kids in the process! Wow. I concur! Taking the time to fold all those little things, when we could be teaching, or playing, or doing whatever else is on our long to-do lists? Hah! I am on board. Yes! I love this. This usually happens at our house whether we declared it or not. Although we can't really find our clothes well when everything is unfolded. For us, I find that it is much easier to to leave our bottoms unfolded and hang the tops (lay them out flat in a big pile all facing same way then stick hangers in all of them before hanging -it goes really fast) then the kids can find their shirts fast – most of my kids can do their own. I find that hanging shirts is the easiest thing to do with four children. I do sort and lay out their shirts…they put them on hangers and then put them in their closet. There is no way how they rummage through things that their shirts wouldn't be a jumbled mess of wrinkles. Hangers are just by the far easiest w/ kids…and everyone. It sounds like hangers are a great solution for many families, that is wonderful! 🙂 I wish our boys' closet had a lower bar in it, at this point they are still too little to reach their clothes on the hangers but that might be a great option as they get older. You mentioned a lower bar in your boys' closet and I actually made one for my son. Get a 6ft piece of chain, a pvc pipe 2ft long and 1- 1 1/2 inch diameter and 2 s-hooks. Run the chain through the pipe then attach chain ends to the higher bar with s hooks. Voila a low hanging closet bar! I'm taking your idea and letting my kids try out your no fold method with their clothes. They sell closet extension rods at Bed Bath & Beyond! 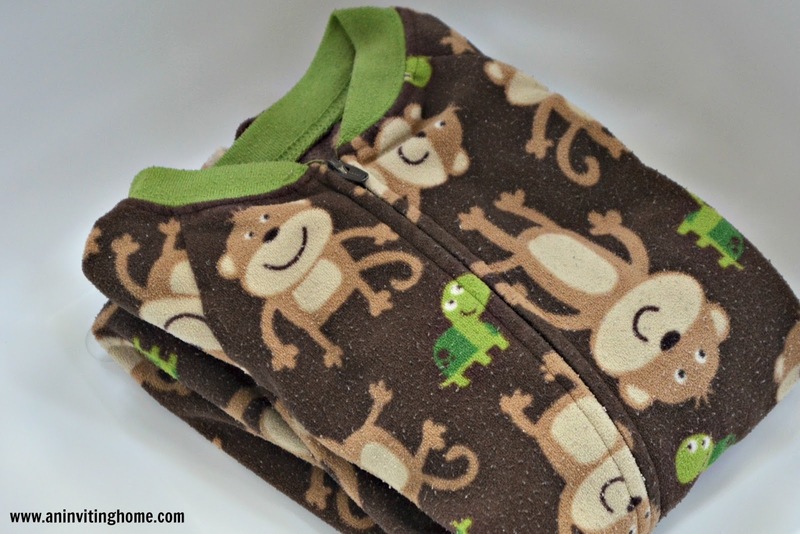 We found them a year or two ago and they're awesome for our kids' closets! Totally adjustable to a variety of heights. I can't go back now. I think they were $20/ea but TOTALLY worth it! I'm loving these laundry suggestions, BTW. Thank you so much for sharing!!! Just found you via Pinterest. My 4 year old will draw a step stool from the laundry room, through the kitchen and dining room, down the hall, and into her bedroom in order to get the shirt she wants from her closet. She then returns the step stool to its place in the laundry room…most of the time. She'll do this even if you offer to help her. She prefers to do it herself. The extension rods are definitely on my must-get list!! That would answer a) how to keep the shirts unwrinkled and b) how to extend space in my boys' closets. They share a closet and it's not huge. I have 9 kids and about a year ago I decided that there was no way I could keep up with the mountains of unending laundry. So now, the older each have a day with a younger child to do their laundry. It stays in their rooms until their assigned day and then they learn to sort, pretreat, fold, iron and put away. It has eliminated the constant laundry in an already too small laundry room and has taught all the children how to do laundry, even if they don't always fold it as I help out Iif they are still busy with their school work. I also do the youngest 3 kids' laundry and my husband's and my own but it now seems s o much more manageable. At first, when you said "I don't fold my kids laundry", I thought you meant that you have your kids fold it. Now I know what you meant! Lol. Not folding at all, now THAT is revolutionary! I thought of that before with underwear and socks (I still try to fold everything, even underwear, because of my "perfectionism" personality, like yours). In short, thank you for your article, it inspires me to start a revolution in our family of six, where these days I've almost given up on laundry altogether. If only I can convince my husband to this neat system….. Revolutionary and time saving! 🙂 Good luck convincing your hubby! I lay everything flat on my bed–1 pile per person. At the end of the day each stack gets transported the the kid's room. My solution for socks and underwear–everyone gets a different brand. It is a lot easier to sort Hanes from Fruit of the Loom from store brand than to look for size tags. And I don't match socks–they are all white–once again, just sorted by brand. It seems white socks are the way to go. I may not choose different brands, but I definitely pick vastly different patterns for the boys: Buzz Lightyear vs. Avengers. They are different enough in age to be "into" slightly different things. If not, then I ALWAYS assign colors to each child. This works for towels, cups, etc. Oldest child: RED, 2nd child: BLUE, 3rd child (girl): PINK, me: PURPLE; hubby: GREEN. It works in our house. Everyone knows whose is who. Underwear could work the same too, but we haven't extended it that far…yet! I started having my older 2 girls do this when I was pregnant and super sick with my 4th a year or 2 ago!! LIFE CHANGING!! My girls sort and put away clothes 4 all 4 kids. Only way our clothes get done! Thank you, thank you, thank you. This is a game changer for me. Why have I never even THOUGHT to NOT fold their laundry?? It totally gets all screwy anyway! I'm going to implement this, like, yesterday. 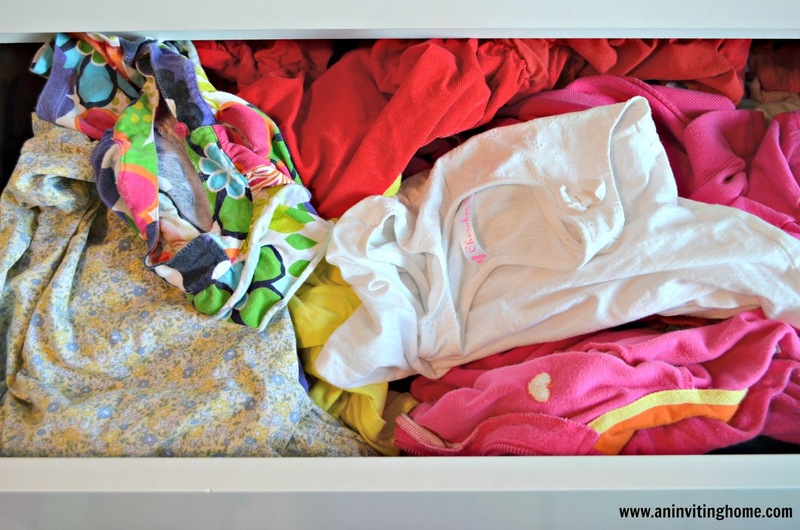 I HATE laundry…..I do…I don't know why but its something I dread and I LOVE your drawers because that is what my kids drawers look like ALL the time even after I take all that effort to fold them into such nicely little bundle's. I have yelled, grounded, spanked, said nothing but let the disappointment talk through my eyes about having their drawers neat and to stop making such a mess. AND reading this post it was like you came up to me and flicked me on my forehead and said, "Get out of it Catherine!!" What you said, "Being happy and having our hearts happy" is SO true…so right now as I stare down my 3,423,894th loads…I am so excited to tackle them and just put them into the drawers!! No more stress about the laundry NOT being done and actually everyone having clean clothes. Oh man, I both love and hate this post. I love stacks of neat clothes but the honest truth is, our clean clothes spends more time sorted in piles on the guest bed than it does folded in our drawers because it's ALWAYS waiting for me to fold it. We live off the unfolded piles, why can we live out of the unfolded drawers? I am going to stop trying to be perfect and realistically send my children to dump their clothes in their drawers and have a happy heart. Each person in the family has their own basket for dirty clothes. When requested in the laundry room, they are washed, dried and I am folding (or hanging) every item within 30 seconds of coming out of the dryer. Everything is neatly stacked back into the basket, ready to be placed neatly in drawers. And yes, I have taught the children from a very young age to rotate items in their drawers so that things are worn regularly (not just the top two or three shirts). Yes, it probably takes more than an hour each week, but I love neat, tidy clothes with very minimal wrinkles! 🙂 I find JOY in having all the clothing items neat, clean and organized. You had me smiling the whole time I read this! 🙂 Yes, what works for one family won't always work for another. Hopefully this post let you realize how much joy you have when clothes are neat, clean and organized. That is the most important part! 🙂 Thanks for sharing! Sarah- when you commented on my blog, I knew I recognized your blog name but couldn't remember exactly which one was yours…. I didn't realize you were the LAUNDRY GENIUS!!!! My friends and I have been raving about you for days now, ever since I pinned your laundry posts. I can't believe how brilliant it is to NOT FOLD THE DARN LAUNDRY! You're right- it just gets all crumpled up anyway! I have a family of 5 and the laundry is SWALLOWING ME ALIVE- I cannot imagine a family of SEVEN! You are amazing, and I shall owe my future sanity (b/c I am still not sane, but I will be someday) to YOU! Love you blog so much! I have 6 kids and it is a full days task to wash, fold and put away a family of 8's clothing. I need to try this! I used to fold everything "just so" and then I realized on some things, I actually use them so quickly that I almost need to wash them again them before I get them folded (I go through about 3 kitchen towels a day). So now I only fold certain things. Things that do not get folded in my house include, my socks and kids socks, kitchen towels and rags, cleaning rags, toddlers clothes only get minimal folding to fit into the drawer without getting lost in the shuffle (which typically means they get folded in half lengthwise), my older son's underpants and my underpants, most of my shirts get hung on hooks on the inside of my closet door. I installed 7 hooks inside my oldest son's closet, I had intended to hang his clothes for the week on the hooks, but I didn't get big enough hooks…his clothes are bigger than I thought :(, so they don't work as well as I had hoped. So for now his clothes are still being folded. Once I correct the hook size problem, I will stop folding his clothes. Hubby's stuff gets folded because he works out of town 4 days a week and he has to transport it. I love love love doing laundry for some reason but my thing is I cannot stand putting it all away. Recently my 3 yr old wanted to help fold so she folded most of her stuff and put it away. It was AWESOME!!! OMG, I'm not the only one! I have three children, and BOY do they have a lot of clothes! We don't have a washer and dryer at home, so when we go to the laundry mat, we try to fit everything into the biggest washer there. No sorting of whites or colors here. It makes everything so much easier this way. After we're done drying, we just shove everything back into our laundry baskets and head on out as fast as we can. I always wonder if people think oddly of us because we don't fold or sort and just pick and leave. Lol. The life of a mom… Oh, and I'm from the Twin Cities also! So glad to have found your blog! Loving the inspiration! I didn't read through all the comments but I have two reasons I will probably still fold clothes, even with five, soon to be six kids. First, I would have a hard time fitting the clothes into their drawers if they weren't fold. My kids are each given 12 outfits for the season, so I don't think they have a crazy amount of clothes. Secondly, I want my kids to grow up knowing how to do laundry – so my older two are in charge of washing, drying, folding and putting away their own. But the thought is appealing. Thank you again for the freedom I have found in laundry!!! Have a great night! This is so awesome! We are moving on Sunday and if I can't figure out how to do a family closet (I miss mine so much!) I'm so doin this cause you're right look at (almost) any kids drawer they're a mess but who care…not me! I liked the idea…. at first. But then I thought that I want my children to learn to fold their own clothes eventually… What am I teaching them? Shouldn't they take part in caring for their own belongings? We all get together and fold together… It's boring and tedious but it gets done. 4 kids for me and we both work full time.. Maybe if they were all babies and toddlers but not as they get older. I am torn…. I'm a single mom of 3 young boys. I work full time and have a 2 hour commute. I have a washer but no dryer, I could only afford the washer. So I have a big drying rack. it takes SO LONG to clip every sock, every washcloth, every pair of underwear. I want to scream when my children wear something for 5 minutes and spill something on it. Not a good response, I know. I need to do something, but what? I have a potty training 2 yo also and his pants always smell like pee even after they're washed. 🙁 Help? Advice? I've debating letting it build up all week and taking it to a laundromat on the weekend but 3 boys (one ADHD/ODD/aspergers, one aspergers, and one 2yo) in a laundromat for 2-3 hours sounds like a nightmare. I'm so sorry to hear about all of the challenges that you are going through…wow. Do you have anyone in your community of friends that might have an extra dryer that they could give you. We currently have one sitting in our garage that a friend needed to move out of storage. We are just waiting to hear of someone that could use it. You don't happen to live near the twin cities do you? This stage is so hard. I try to take it one moment at a time. Praying that relief comes for you! You have just changed my life. Thank you! I had 4 baskets under my 2 boys beds with each of the kids clothes in them. They'd get put away if they were folded but that rarely happens. I'm now giving myself permission to put the clothes away in the dressers without folding. Then we don't have to rummage through baskets for each piece of the outfit. Seriously, thank you so much! 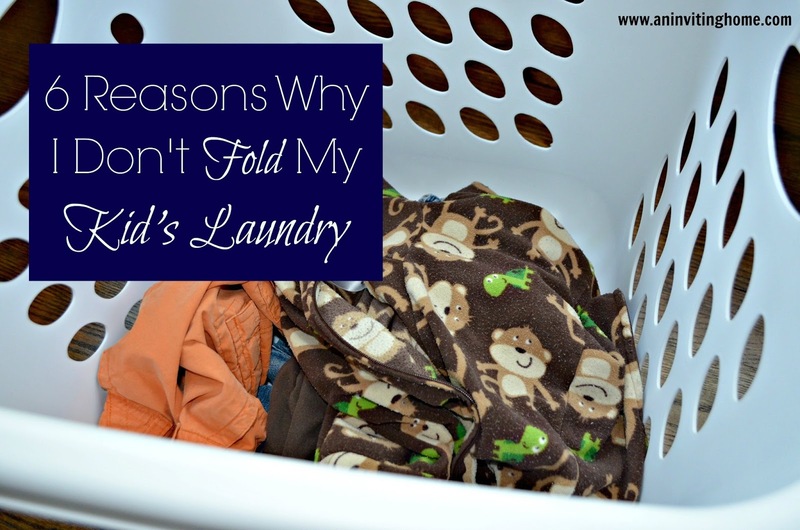 I not longer feel like I might be a "bad" mom for not folding my oldest clothes anymore. Last year we gave our 10 year old control over her room. This meant she no longer wanted to use her dresser. So my nicely folded clothes ended up on the bed all messed up. We stopped folding them about 6 months ago! I think I will start this with my son as well (he's almost 3) He has started picking out his own clothes and yes the drawers just get messed up. I have a rod hanging from the ceiling over my washer and dryer. To the side I have a cabinet with a basket for each person. As clothes come out of the dryer shirts are shaken to remove the wrinkles and hung immediately. Pants and shorts are folded but everything else is just thrown in the basket. Everyone takes their basket every day or two and puts away their own clothes and returns the basket. I have 3 kids, ages 4, 2, and 6 months. Does my husband count as a kid? Lol. I was slightly skeptical when reading this article, as I have (like many of the other commenters) spent so many endless hours separating, folding, and putting away. My older two share a dresser, which never looks neat for more than a day. I even spend lots of time folding our laundry, to just shove it in the dressers and it ends up all messy anyways. I want to just be done with it… I think I might buy my kids "trunks" or ottomans to set at the foot of their beds to just throw everything in. Man, your method plus bed ottomans sounds ideal. Thanks! No, no, no!!!! I don't have the space in our tiny home for laundry baskets full of clean clothes. Why???? I finally read a household tip that would totally make a HUGE difference in my life and I can't figure out a way to implement it. Grrr! I had the chore growing up of doing my family's laundry. The whole family. Since I was about ten. My husband laughed at me recently because he said that if I weren't so picky about the way the towels were folded, I would get more done. He's right, but how? Our house is so tiny that if everything isn't disgustingly organized, it will be complete chaos. Ugh. I need a maid. With more than 5 kids I can understand the logic in this. I can also understand the frustration when freshly folded laundry gets messed up. However I believe this is bad advice. Whilst certain things are difficult to fold like sleepers and fitted sheets, to say that kid's clothes don't stay folded well and that you can't really fold size 2 jeans is misinformation that women may use to justify doing less work which then teaches the children that throwing clothes into a heap rather than folding them or hanging them up is normal and acceptable. I believe not folding older kids laundry and having them do it themselves is good but tossing them in collecting bins, whilst giving some freedom, is teaching bad habits at least. Do you just put it into their drawers unfolded? I've got a Husband who sounds like one of the kids, we are redoing our wardrobe as we've got a very high but only hanging rods old-school wardrobe. I'm trying to find a good technique for him as I don't want him to wreck my organised cupboard as soon as it's all done, but unfortunately I cannot possibly hang ALL his shirts + pants AND shorts, but I can't fold and shelve as I know it'll be atrocious the next day! The kids put their clothes away. It is all unfolded in the basket and then I've showed them how to lay it out in their drawers to minimize wrinkles. It works really well since their clothes are smaller and the drawers aren't packed. Unfortunately for my husband the not folding thing wouldn't work because of size & space so I fold his clothes before putting them away. 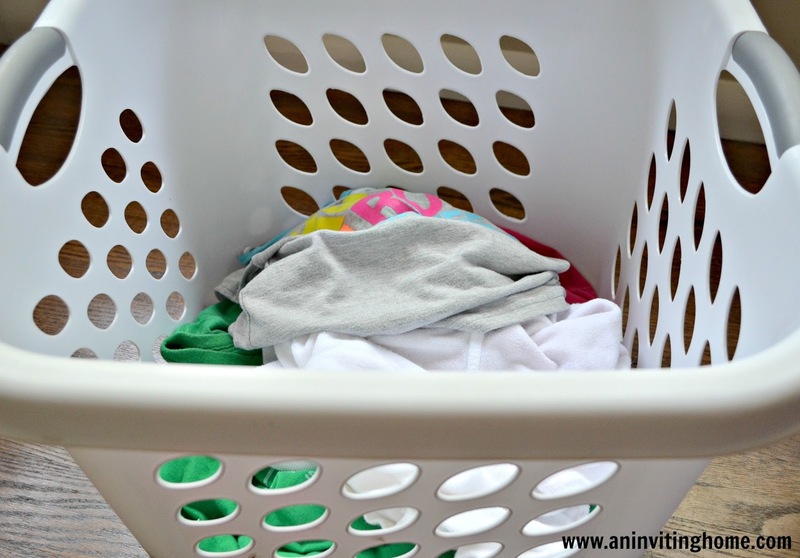 I want to thank you for this blog post, it has saved my laundry life! I have 4 kids that are 5 and under, and my laundry has always been out of control. After I read the title of your blog post, I'm like what? I've never heard of such a thing! But the more I thought about it the more I was willing to try this method, and put aside this unrealistic idea of how laundry should be. Currently I have only one load of unwashed laundry, and it's all because I stop folding my kids laundry. It has freed up so much of my time! Thanks again for helping me find a system that works.